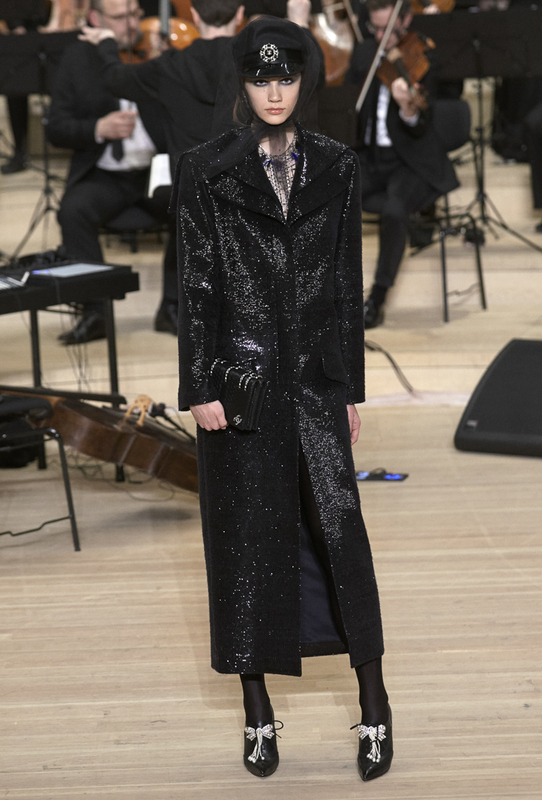 Karl Lagerfeld has chosen Hamburg and the Elbphilharmonie to present the new CHANEL Métiers d’art collection. 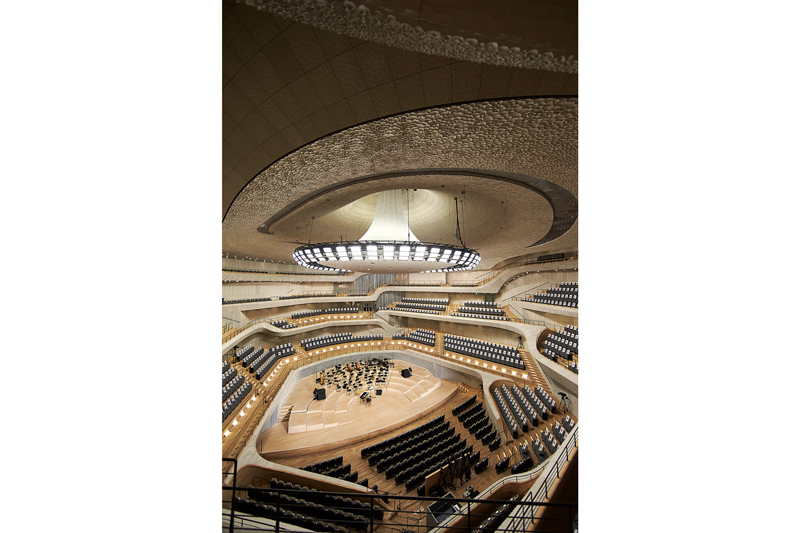 An extraordinary building conceived by the architects Jacques Herzog and Pierre de Meuron, this concert hall sits majestically by the river like a futuristic liaison with the city’s industrial port. Built on top of a tea, tobacco and cocoa warehouse in typical Hamburg bricks, the glass building is 110 meters high with a roof that undulates like a wave. Both futuristic and authentic, preciously preserving its roots, this architectural feat was inaugurated at the beginning of this year. Past, present and future. 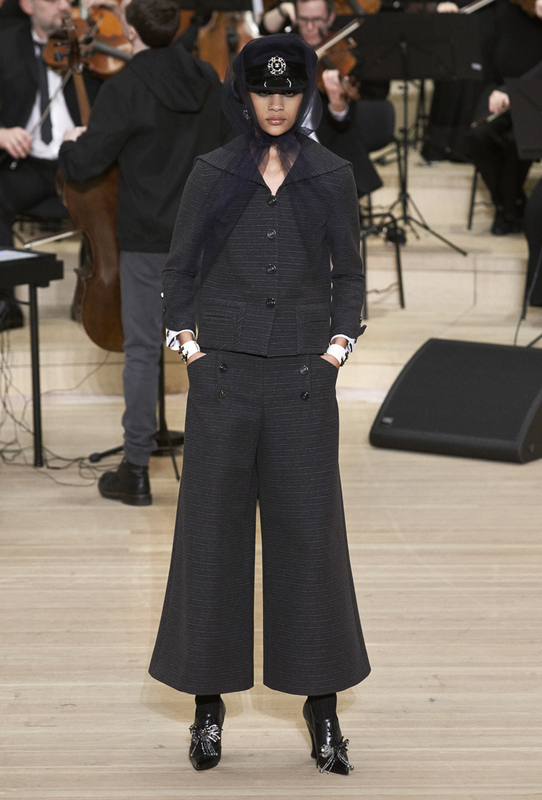 The three units of time that have inspired Karl Lagerfeld for this Paris-Hamburg collection. 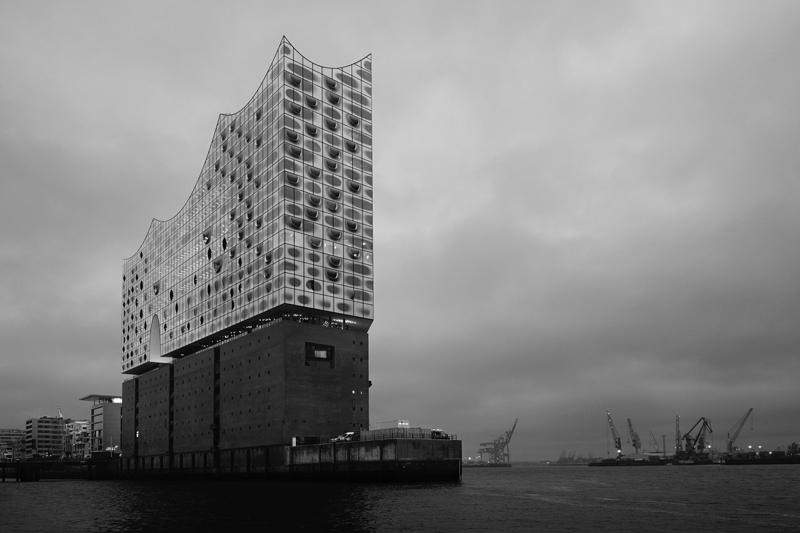 Around these three axes, the designer infuses images of the Hamburg port, with gliding silhouettes of the merchant navy crew that he disrupts with the modernism of CHANEL. 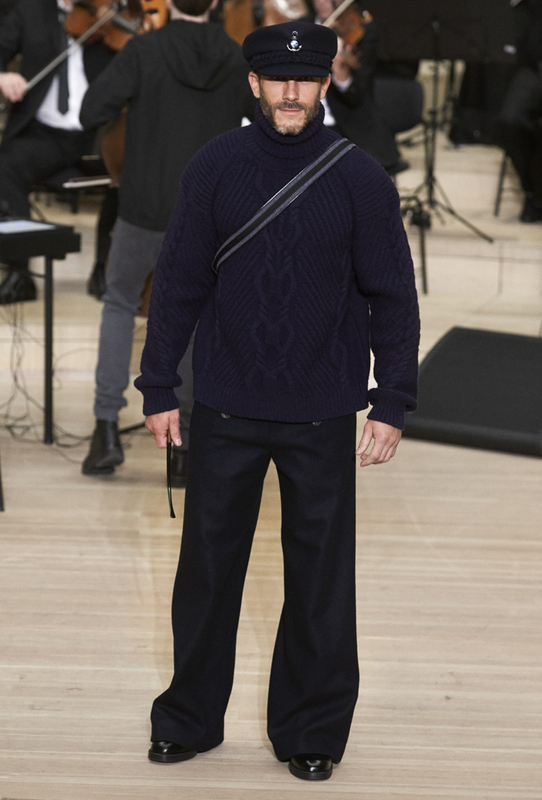 He revisits their wardrobe, re-appropriating their pea coats, their drop-front trousers, sweaters and immutable caps. 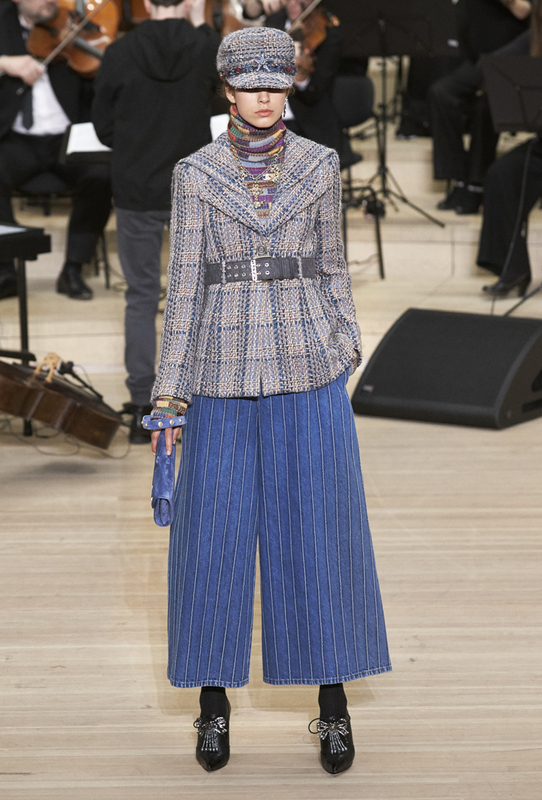 While the spirit of Gabrielle Chanel – she who stole the striped sailor top and pea coat from men – is never far away, Karl Lagerfeld has enlarged this vocabulary of masculine/feminine by multiplying the details and reinventing the codes of the House to create a unique, daring, confident and ultra-feminine attitude. 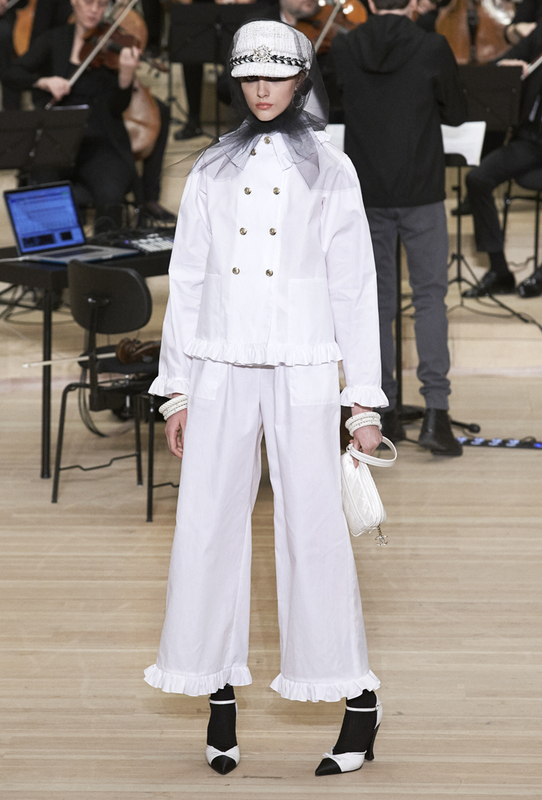 It is a pure and graceful line, a look punctuated with sailor collars, jackets that are more or less fitted, long redingotes, mini-skirts and extra-wide trousers designed to feminise this 76-strong crew of “sailors who haven’t taken to the water”, tells Karl Lagerfeld. In a cap pulled firmly down or occasionally veiled with a tulle scarf, their hands swathed in fingerless gloves, they pass with legs wrapped up in long knitted socks wearing bobbin heeled brogues with beaded bows. Tweed is accompanied by broadcloth, cashmere and flannel; silk crêpe alternates with chiffon and a discreetly scintillating jersey. Woven patterns draw inspiration from the bricks of buildings that surround the docks in the port and the stacks of multicoloured containers that arrive by cargo ship while buttons take the shape of precious anchor bolts and braided woollen threads evolve into downy cordage. 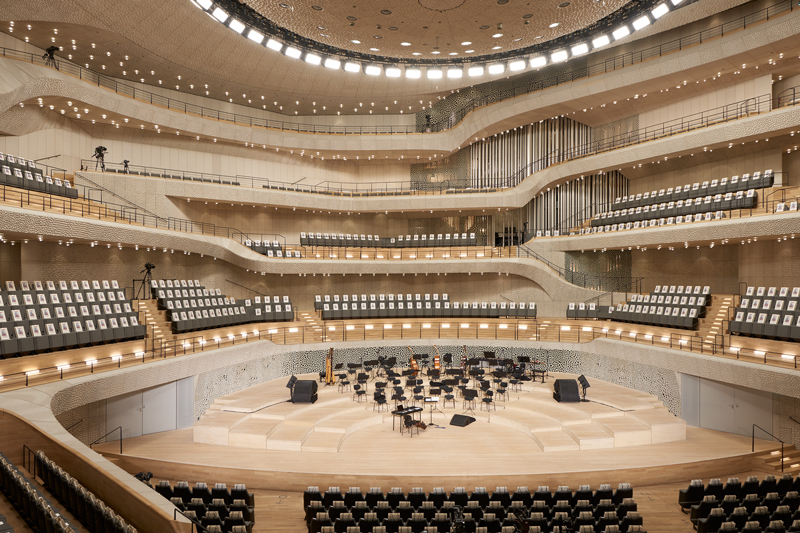 Feathers, embroidery, rhinestones, mother-of-pearl and beads all call for a sophisticated evening at the Elbphilharmonie. Black, beige, grey, navy blue, brick, pinstripes, flashes of gold and red make up a minimalist palette. 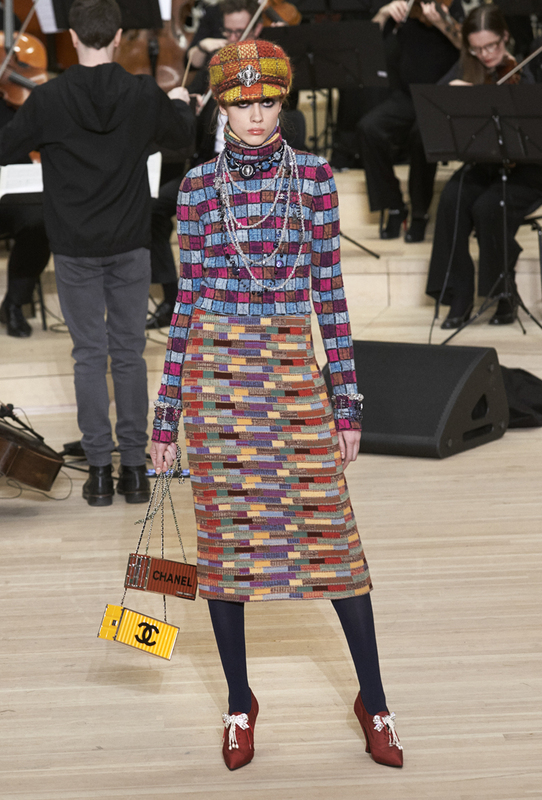 Chanel’s Paris, more than ever, united with the orangey hues of Hamburg’s architecture. With a flared cut, the CHANEL jacket becomes a pea coat. Another one, longer with a high collar, is high-waisted for a broader drop. 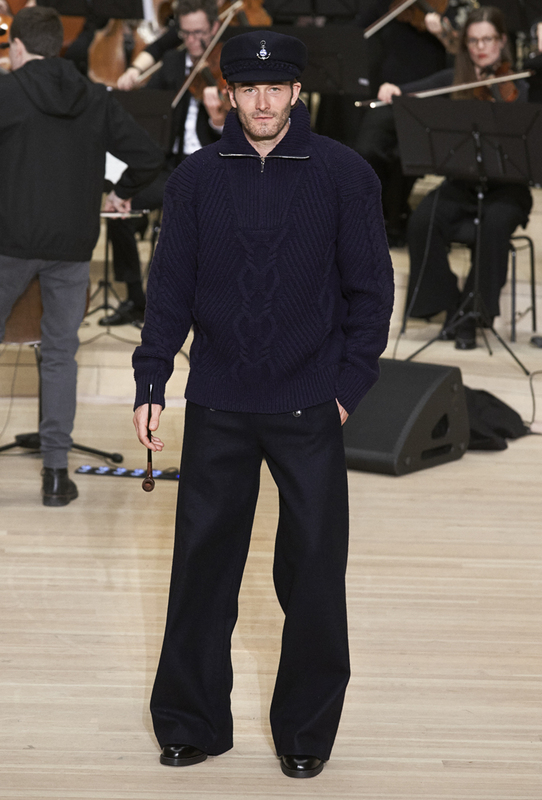 The drop-front trousers are widened and come in both short and long versions, braided down the seam with a tuxedo grosgrain ribbon. In contrast, the straight skirt becomes “a sailor skirt”, as Karl Lagerfeld calls it, with a waist marked by a double-button drop-front. The iconic tweed suit is embellished with a sailor collar knotted with a regatta scarf and is worn with a mini-skirt. Another is wrapped up in cashmere, the collar closed with rows of pearls. 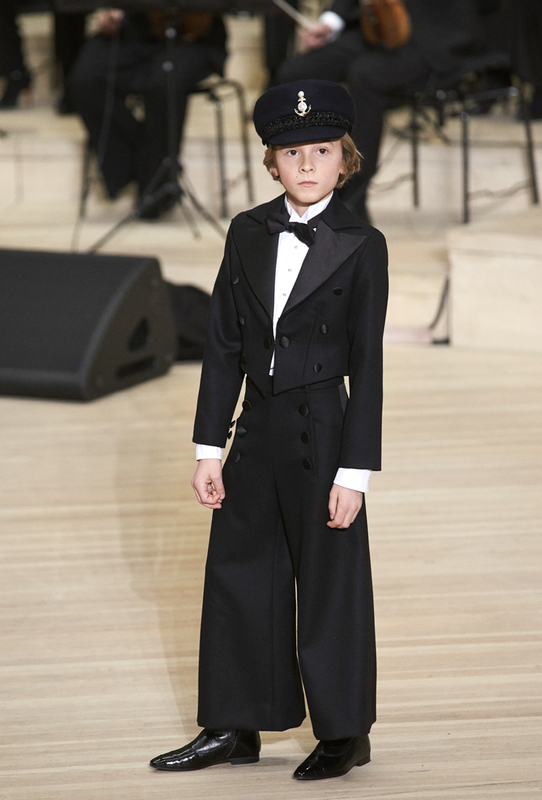 The trouser suits in vertical or horizontal pinstriped wool are fastened with an officer’s collar and open cuffs on a trompe l’oeil in white cotton piqué. The captain’s spencer jacket warms a wide-legged jumpsuit. 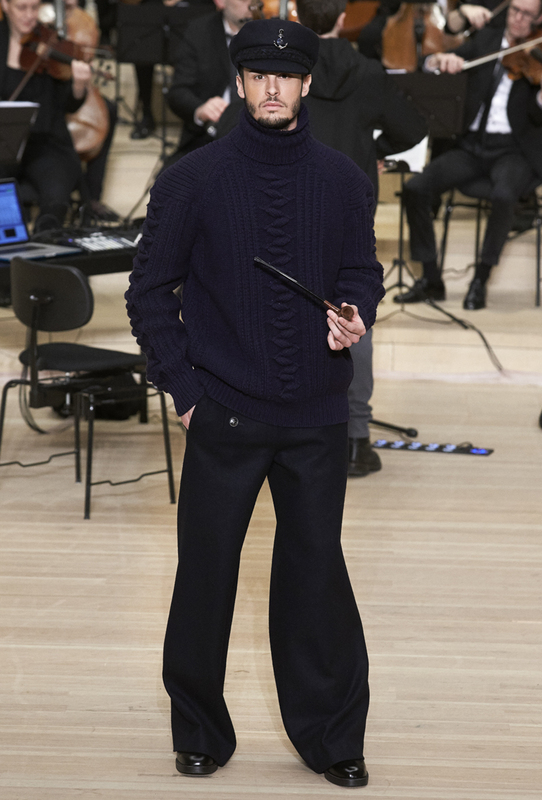 His long redingote comes in woollen corduroy or in knitted tweed. A slender coat features a trompe l’oeil jacket and his overcoats with a slightly curved back in checked tweed or navy blue ribbed wool are fastened with anchor bolt buttons. 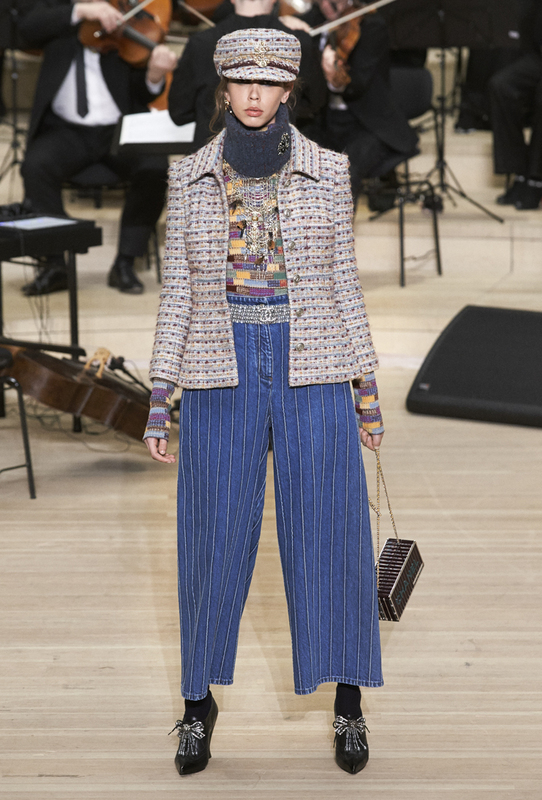 Certain jackets and certain trousers are sequinned, in bright orange woven tweed and recall the red-light districts of Hamburg, there where the sailors seek refuge on land to the sound of ditties played on the accordion, instrument that Karl Lagerfeld transforms into a little bag with a shoulder strap. 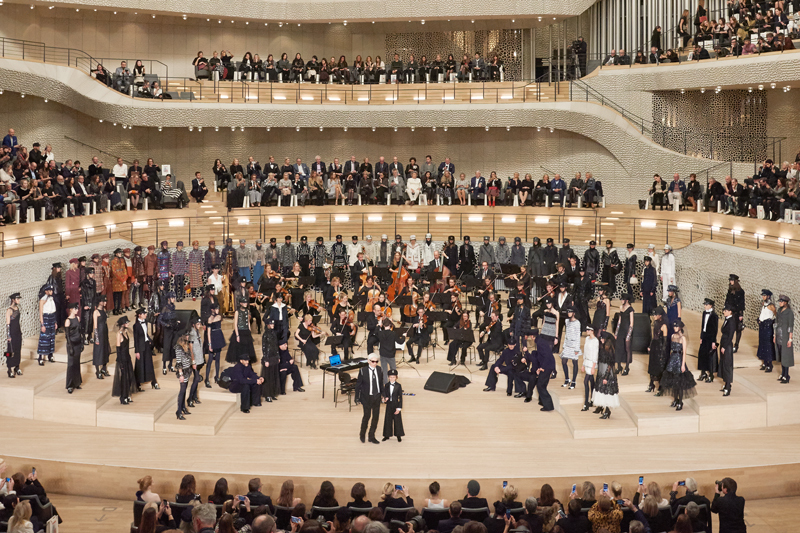 It is at the Elbphilharmonie that everything happens for an evening. 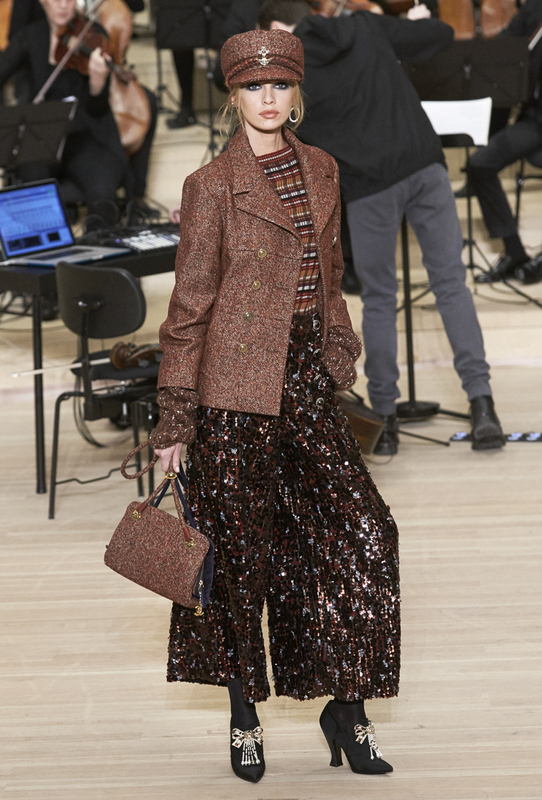 Worn with a godet pencil skirt, a woven tweed jacket assumes the tones of the sun reflected in its windows. We hurry there in a drop-front sailor’s skirt in black and gold tweed or in black satin, worn with a blouse in crêpe and a large regatta scarf, or in chiffon with an openwork sailor collar in Valenciennes lace. We wear a suit covered entirely with mother-of-pearl, a pair of wide-leg trousers sparkling in sequins or quilted jackets worn over leather trousers. 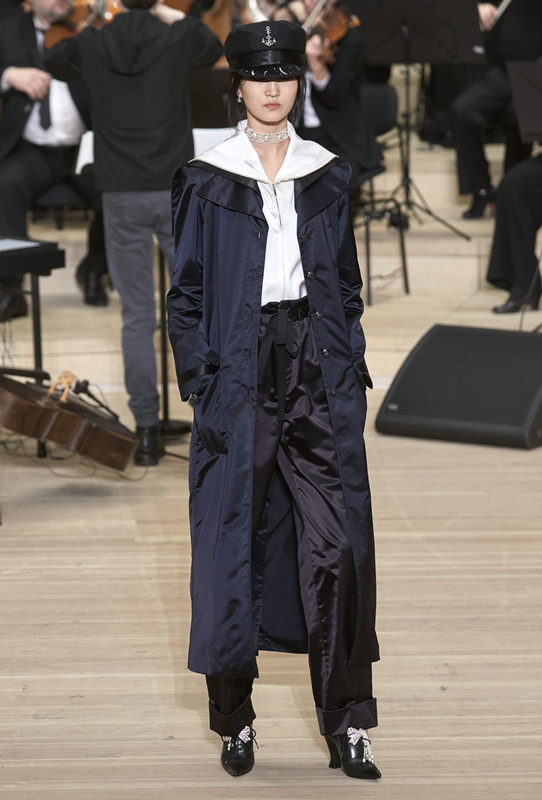 For opening nights, it’s fluid straight sheath dresses in midnight blue crêpe with sequin-embroidered sailor collars that appear alongside flounced skirts in silk tulle and a military waistcoat in embroidered tulle and lace. Hands are veiled in long embroidered fingerless gloves. 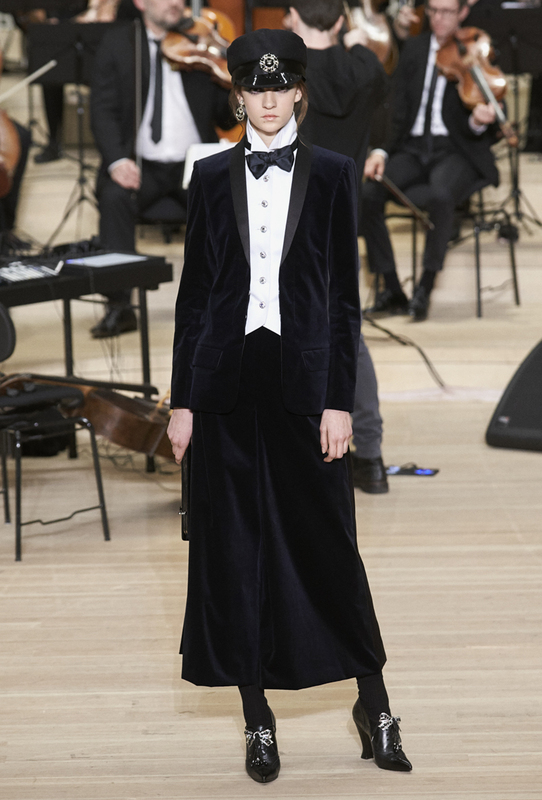 We also see impeccable tuxedos in black crêpe. Long asymmetric dresses in iridescent crêpe open to reveal mini dresses of multicolour sequin-embroidered tulle. Shaking up the codes, Karl Lagerfeld transforms the casual striped sailor top so dear to Gabrielle Chanel into a dress embroidered entirely with painted feathers, collar and cuffs in sequins and precious stones, or lengthened with a satin skirt hemmed with feathers. The sailors are more elegant than ever, in outfits of white cotton, trimmed with ruffles. In terms of accessories, the fetish sailor’s bag is secured firmly on the shoulder, ready for a long voyage at sea, the minaudières take form as containers and life buoys. Karl Lagerfeld dresses CHANEL’s GABRIELLE bag with an elegant checked tweed in colours typical of the city of Hamburg’s brickwork. Marine anchors appear on earrings and brooches while their chains become sautoirs and bracelets improvise themselves as cordage. 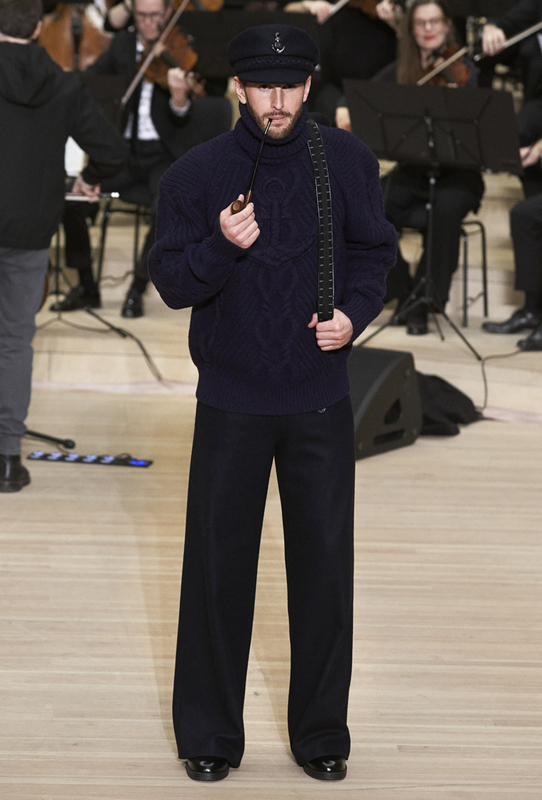 With this collection, Karl Lagerfeld speaks about a look and an attitude. 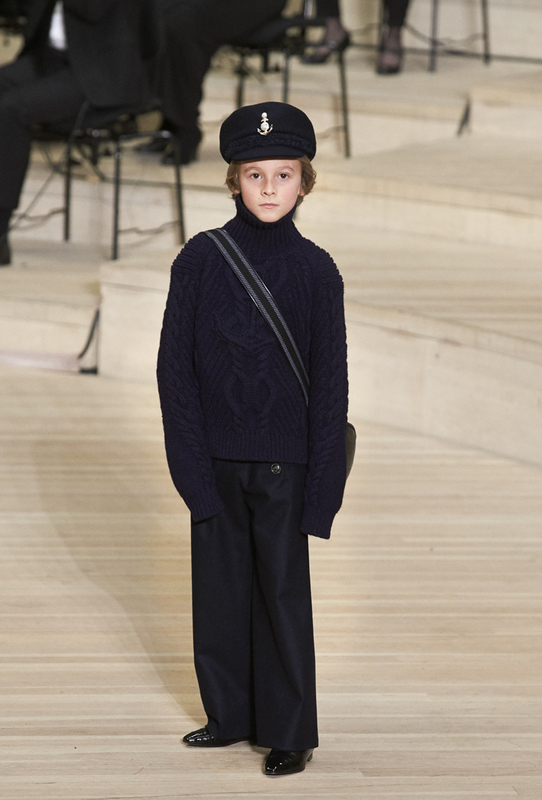 Masculine is more feminine than ever when the latter is rendered more virile with a cap and understated rigorous lines. The CHANEL woman is unique and inevitably stands out: “dress a woman in black and white at a party and you’ll see only her,” affirmed Gabrielle Chanel. 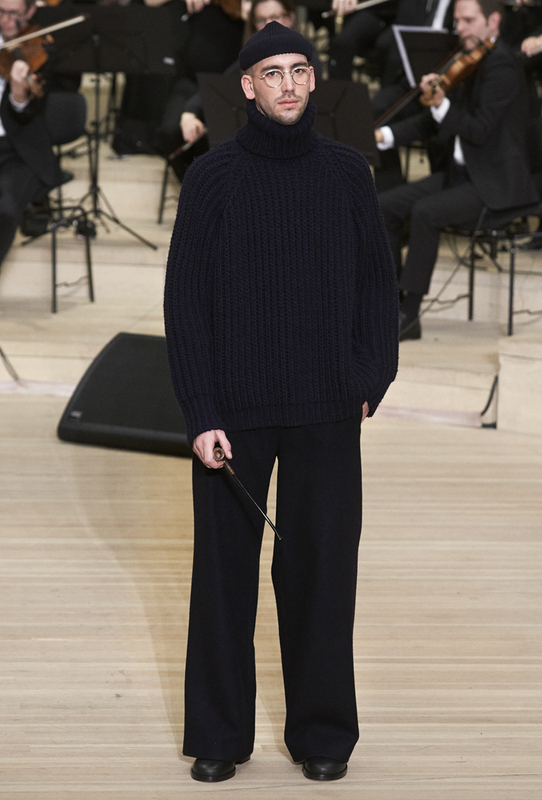 In Hamburg, Karl Lagerfeld adds mystery and depth. With the utmost elegance. Celebrities including Ambassadors Kristen Stewart (Face of the fragrance GABRIELLE CHANEL), Lily-Rose Depp (Face of the fragrance N°5 l'Eau), Tilda Swinton, Rinko Kikuchi, Marine Vacth (Face of the Cruise 2017/18 collection) and Anna Mouglalis, English actress Kaya Scodelario and Australian actress Phoebe Tonkin, German Top Model Tatjana Patitz, German actresses Marie Baümer, Hannah Herzsprung, Johanna Wokalek and Sandra Hüller, German actor Lars Eidinger and director Tom Tykwer attended the presentation of the CHANEL Métiers d'art 2017/18 Paris-Hamburg collection this Wednesday, December 6th 2017. On stage, the London-based cellist, composer and producer Oliver Coates played, with the ensemble Resonanz, an original music specially created for the show.